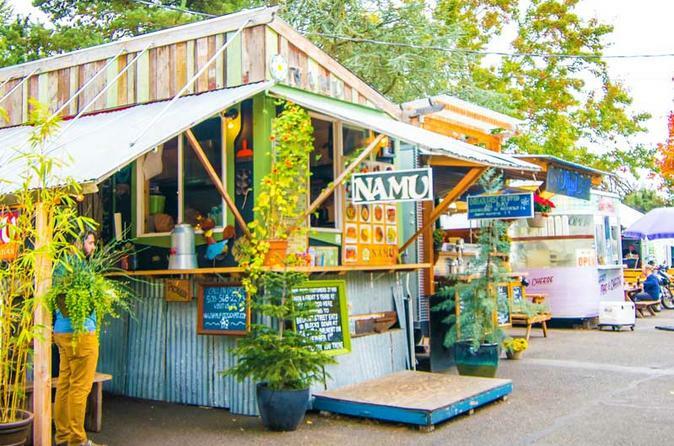 Explore Portland’s best food carts, historic neighborhoods, and iconic bridges on this 3-hour city-wide culinary adventure. Sit back and relax in your Eat Van as you are guided through the streets of this foodie city to areas known only by locals, with delicious eating stops along the way. You will have an opportunity to meet the owners, learn their individual stories, and taste truly authentic and award winning dishes that represent cultures from around the globe. Your Food Cart and Neighborhoods Tour begins by meeting your dedicated tour guide at the historic Heathman Hotel. From here you will board into the EAT Van where your guide will chauffeur you through downtown Portland on a short ride up to the vibrant Mississippi neighborhood. North Mississippi Ave has changed a lot in the past few years and is now home to many restaurants, music venues, and a very good food cart pod. You'll sample your first few bites at a local food cart favorite here. Next you'll hop back in the EAT van, (his name is Harold) and head over to the colorful Alberta Arts District that is becoming known for its boutique shops, art galleries, street murals, bike shops, restaurants, and more. Your guide will share history on the early Portland settlers, and a few of the different changes the north end of town has seen. You'll make a food stop here and sample one of Alberta's more eclectic food pods. Next, you'll get back in the Van and journey south where you'll get to enjoy views of Portland's beautiful green neighborhoods. You'll pass by the family friendly neighborhood of Beaumont, see one of Portland's best designed inner-city parks, until you'll make your way to the very popular neighborhoods of Belmont, and southeast Hawthorne. The Belmont and Hawthorne neighborhoods are known for showing off Portland's strong sense of individuality. Most of the shops, as you'll see, are independently owned and operated. You'll get to experience the mix of urban diversity, the funky feel, and colorful residents that reside in these neighborhoods. You'll make a stop along one of these streets to sample a local food cart pod, whose fare takes the farm-to-table concept and brings it into a cart. Afterwards you'll head south to the exciting neighborhood of southeast Division. Here you'll get to understand why this street was named top 10 foodie streets in America! Here on division you'll visit one of the newest, and most friendly food cart pods in Portland. Your guide will take you back to downtown Portland where the tour began. Please be advised that although this is a driving tour, you will be getting out to explore the food pods, so please wear comfortable shoes and dress for the weather. The ticket price include all transportation, food & beverages, and expert tour guide. It is also advisable to book this tour 24 hours or more before tour starts.